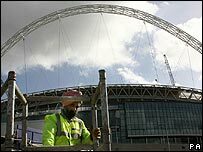 Poor relations between the owner and builder of the new Wembley caused the project to fall further behind schedule, an industry expert has said. Multiplex and Wembley National Stadium Limited's "increasingly acrimonious relationship" was blamed by David Rogers of Construction News. He said unresolved wrangles between the two had led to problems escalating. Multiplex has now said the north London stadium will not open until June 2007 - two years after the initial deadline. Deputy news editor of Construction News, Mr Rogers, said both parties had to take some responsibility for the delayed project. "Multiplex was at fault in the early part of this saga. They were the builders and they were charged with building it on time and they didn't," he said. "But Multiplex say there have been up to 600 design changes and Wembley National Stadium has failed to carry out a series of critical works so they have an element of culpability in this." Mr Rogers explained that a lot of the problems came down to money. He said over the last 18 months the two firms had failed to work things out and the relationship between them gradually deteriorated. "Multiplex is fed up with being blamed for everything and have decided to hit back. "Clearly they have had some problems, which they have taken responsibility for, but I think the role of WNS has to be questioned. "There is a huge blame game going on and a huge PR battle because everybody can see it and everybody knows what it is but no-one knows when it's going to be open." The stadium was due for completion in August 2005, but hold-ups have led to events, such as this year's FA Cup final, being rescheduled and played in Cardiff. An FA spokesman said no plans have been made to book the Millennium Stadium in Cardiff for the 2007 final.